P: Your Highness, your twins are here to consult about their gowns for this evening’s festive soiree. QJ: You may handle it. I ‘m busy reading this article that says greed is good. QJ: I’m working on plan B. If this article is correct, Pansy, then I’m off the hook. Queen Thistle simply can’t hold me responsible for doing something bad if in fact it is good. P: I’m afraid I don’t understand. QJ: It’s all in the spin. If something looks bad, then just gloss over it with something that looks good and then it is good. We’re taught that greed comes from selfishness, right? It stems from one’s egocentric failure to limit the boundaries of the Self. QJ: One’s complete personality, the whole enchilada. P: Would you like me to order enchiladas for tonight’s festivities? QJ: Do they go well with chocolate covered cherries and marshmallow macaroons? QJ: Forget the enchiladas. But here in the second line of the third paragraph it specifically states that greed arises not from an expanded sense of Self, but from a lack of Self. Now everyone needs a Self, Pansy, and when I tell this to Queen Thistle, she’ll be only too happy for her son to marry both my daughters. There’s no finer way to secure one’s Self then to have an heir and a spare. P: But your Highness, that’s against the law for a prince to marry two princesses at the same time. QJ: Drat. You’re right. Could I have a biscuit? Make that two. P: Does this mean we’re back to plan A with the witches and trolls, milady? QJ: It would seem so. I wonder if Lady Macbeth felt guilty as she plotted her crime. P: She was a witch, your Highness. Witches don’t do guilt. QJ: Perhaps. But I do. So I prefer to think of Lady Macbeth not as witch, but as an anti- mother. If truth were told, Pansy, some of us aren’t cut out for motherhood, even though it’s the only way in which we wield power. Macbeth was prepared to exercise her power by dashing in the brains of her brat. Apparently in those times, infanticide was all the rage. But I’d like to be more delicate than that. P: What did you have in mind? QJ: At the soiree tonight, I want you to dress up as the Christmas Witch. We’ll pretend that you’re there, as is traditional, to do a divination. Then when the lights go out, you whisk Bella Dona off to a new home with foster parents across the sea. P: Me, a Christmas Witch, milady? That’s not my forte. QJ: The alternative is murder, Pansy, and I’d like to remind you that it was you who made me eat both flowers. P: I’ll commence working on my witch costume immediately, your Highness. QJ: That’s the spirit. OK, now open the floodgates and let my, er, umm, the twins in. B/BD: (enter) Mama dearest. It’s been months since we’ve been granted an audience with you. OJ: Don’t exaggerate. You’ve only been born four days. Daisy, sit here on the floor beside me. Bella Dona, you and your goat sit over by the bookcase and don’t let him eat Daddy’s first editions. Now girls, what are you wearing this evening? BD: We are wearing matching gowns of daffodil watered silk with ivory lace collars and mother of pearl buttons. QJ: You may not wear matching gowns. Come up with something else. BD: But Mama, twins must dress alike. We’re a symbol of wholeness. QJ: Where did you hear that? BD: In your CG Jung book. QJ: Was that your father’s idea to have you read that? QJ: That man has taken leave of his senses. Children should not read books. It puts ideas into their heads. Now listen, the both of you. You are not to wear similar gowns tonight. I repeat, not. I want Daisy to wear a white dress, and I want Bella Dona dressed completely in black, as it suits her, her, um, complexion. Any questions? QJ: Good. Now I’ve got to go supervise preparation for the celebration (exits). P: I suggest you do as your mother says (exits). BD: I smell a rat. D: What kind of rat, sister dear? D: Mama can’t be that ratty if she wants me to wear white. White is the symbol of purity and faith, the perfection of the feminine, the source of all life. I like that. BD: And she wants me to wear black. Black is the symbol of treachery and sorrow, a step closer to death. Do you like that too? BD. Look, the point is even though black and white are flip sides of the same coin, which would you rather be, sister? D: I see what you mean. But at least you don’t have to marry Queen Thistle’s fat, ugly son. I overheard Mama tell Pansy in the rose garden that I was the chosen one, and that’s something I could do without. BD: Did you also happen to overhear Mama’s plans for me? D: I don’t think there were any. BD: Exactly. Look here, Daisy. You know the old nursery rhyme – “On Christmas Eve, heads will roll of those foolish enough to make merry with witches and trolls”. D: I have heard it. BD: So why would Mama choose to have a party on Christmas Eve when it’s so dangerous to do so? BD: I’ll tell you. Our mother has hired a hit woman dressed as a witch to murder me at the party tonight. That’s why she doesn’t want us to wear identical clothes. The witch must know in advance how to tell us apart. D: Our mother would do that? BD: You have to ask? D: I guess not. And if you were dead, then I’d have to take care of your goat and we’re not exactly best friends. BD: That’s because he represents your sexuality and you don’t have a good relationship yet with that. BD: You’ll figure that out yourself. But now back to my plan for the party tonight. You must wear black and I must wear white. The confusion will put Mama’s plans into a tailspin. D: But Mama was right that black goes better with your complexion. BD: I’m not worried about that. D: But if I wear what Mama told you to wear, does that mean I’ll be murdered instead of you? BD: What if it did? BD: Then let’s make certain that doesn’t happen. We’re inseparable, Daisy, like two peas in a pod. Let’s stay that way, deal? 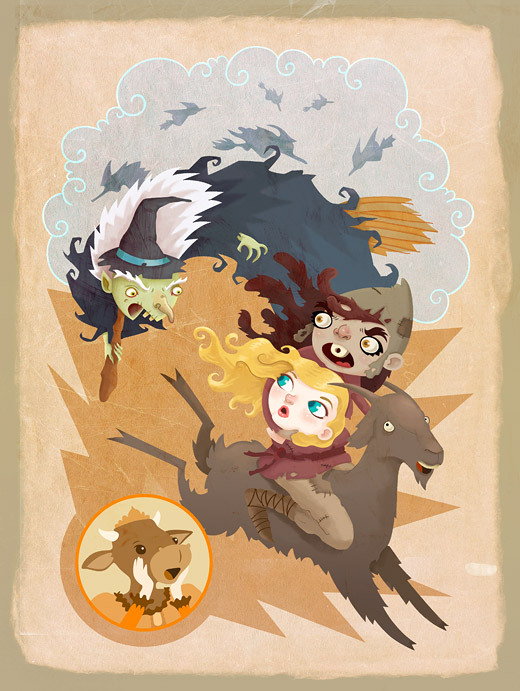 BD: Now if Mama has tricks up her sleeve with witches and trolls, goat darling has a few tricks too. Believe me sister; goat’s tricks are much more clever than Mama’s. D: So what do we do? BD: Tonight, when the lights go out and the tensions rise, together, we jump onto goat’s back and ride away. D: To where will be we riding? D: You mean you don’t know? BD: No, not really but are you still game?